Gun control is now the top issue in the Capitol, sparked by the mass shooting at Sandy Hook Elementary School in Newtown, Connecticut on Dec. 14. Twenty first graders and six adults were killed, as well as the shooter Adam Lanza and his mother Nancy Lanza. 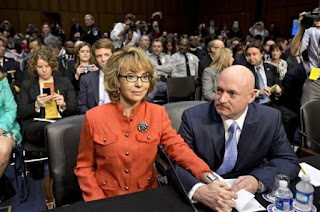 Gabrielle Giffords gave the opening remarks and NRA leader Wayne LaPierre also testified. Giffords, a Democrat, is still recovering from massive head trauma she received from being shot at point blank range in the head at a supermarket in Tucson, where she was greeting supporters. Six people were killed and 12 others were wounded. She said, "Too many children are dying. Speaking is difficult, but I need to say something important. Be bold, be courageous, Americans are counting on you." On the other side, Wayne LaPierre's statement had a milder tone when referring to gun control. "Law-abiding gun owners will not accept blame for the acts of violent or deranged criminals," LaPierre said in his statement. "Nor do we believe the government should dictate what we can lawfully own and use to protect our families." California Sen. Dianne Feinstein, a Democrat and member of the committee, has introduced a bill to ban numerous assault-style weapons as well as high-capacity ammunition magazines. The prospects for Senate passage are not strong, in part because of opposition from the NRA and in part from a reluctance among rural-state Democrats to support limitations on firearms. Senate Majority Leader Harry Reid, D-Nev., indicated that whatever the committee produced wouldn't necessarily be the final product, saying the package would be debated by the full Senate and senators would be allowed to propose "whatever amendments they want that deal with this issue." There will be more hearings in both chambers on "common sense" gun control legislation that majority of Americans are in favor of, banning numerous assault-style firearms and high-capacity magazines. This battle will rage on and it's about time to have serious conversations that lead to serious actions. Thank you for sharing this Kay. Its so important that we do something now to save our future generations.